A new vaccine strategy, which uses synthetic messenger RNA (mRNA) instead of proteins purified from viruses, could make flu shots cheaper, safer, and easier to produce. German scientists have shown that they have been able to protect mice, ferrets, and pigs against influenza. The scientists published their findings in the journal Nature Biotechnology. Most flu vaccines consist of hemagglutinin and neuraminidase, the two proteins covering the surface of the virus. In order to produce these molecules, the three predominant influenza strains are cultured in fertilized chicken eggs or in cell cultures. The virus is then harvested and broken up so that these two proteins can be purified. It’s hard to predict how well a given strain will grow in both mediums and producing enough virus for millions of vaccine doses can take many months. This is problematic when a new pandemic influenza strain emerges. The scientists designed a piece of mRNA encoding the hemagglutinin of the influenza strain H1N1. Cells use mRNA to shuttle the information contained in the genome from the nucleus into outskirts of the cells, where it is translated into a protein. By injecting synthetic mRNA into the skin of mice, the researchers have been able to coax the animals’ cells into producing the virus protein. This elicited an immune response that protected the animals from infection with otherwise lethal doses of the influenza virus. To make an mRNA vaccine, there’s no need to grow the virus. All that is needed is the sequence of the influenza strain. Shots could be produced within 6 to 8 weeks, and the cost of production would be kept low. The vaccine also doesn’t need to be kept refrigerated for storage. It also does away with the danger of anaphylactic shock in people who are allergic to ovalbumin, a protein in chicken eggs that is present in the shots in low amounts. Previous work includes the use of DNA rather than RNA to vaccinate against the flu. These experiments, while showing promise in mouse models, resulted in disappointing clinical trials in humans. The problem with DNA is that it has to cross two membranes to get into a cell’s nucleus. RNA does its job outside the cell’s nucleus and is much simpler. It was previously thought that RNA was too unstable to be used a vaccine, but the scientists overcame this by changing the sequence of mRNA in a way that increases its stability 10,000-fold without changing the protein it encodes. The drawbacks include that the vaccine would only protect against a single strain of influenza and it would need to be reformulated every year. 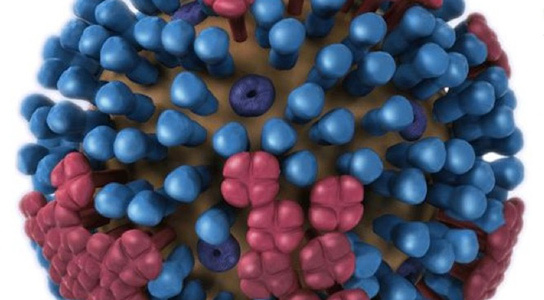 Be the first to comment on "Synthesizing a Flu Vaccine Without the Virus"